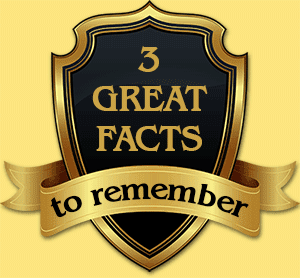 God wants us to know who Jesus is and what He has done for us, so God has given us four accounts of His life. These books in the Bible are called "Gospels," and they are named after the four men whom God chose to write them—Matthew, Mark, Luke, and John. In the beginning of his Gospel, John speaks of the Lord Jesus as "the Word." John wrote, "In the beginning was the Word [the Lord Jesus], and the Word was with God, and the Word was God" (John 1:1). The Lord Jesus has always existed. Before the earth, sun, moon or stars were created, He was there with God the Father. He is God the Son. But there was a time when He became a man and lived here on the earth. The Bible says, "And the Word [the Lord Jesus] was made flesh [became a man], and dwelt among us…" (John 1:14). 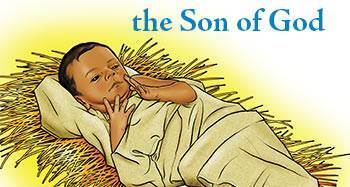 Hundreds of years before Jesus was born, God told the prophet Isaiah that one day a miracle child would be born. Isaiah wrote, "Behold, a virgin shall conceive, and bear a son, and shall call his name Immanuel" (Isaiah 7:14). The name "Immanuel" means "God with us." The child promised by God would be God coming to live with us. Jesus was indeed a miracle child because He did not have a human father. His mother, Mary, was a virgin, a pure unmarried woman who had never had sexual relations with a man. She was engaged to a man named Joseph, but the Bible says, "…before they came together, she was found with child of the Holy Spirit" (Matthew 1:18). Jesus is the Son of God. As a child, He wanted to do His heavenly Father's will. He said to His earthly parents, "I must be about My Father's business." The Bible says, "Jesus increased in wisdom and stature and in favor with God and man"(Luke 2:52). When Jesus was about thirty years old and ready to begin His public ministry, He was baptized by John the Baptist. 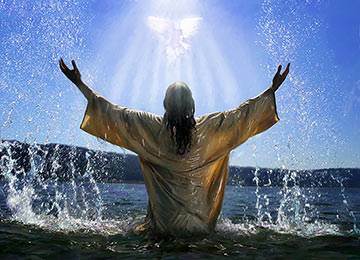 As He was being baptized, the heavens opened, the Holy Spirit came down like a dove on Him, and God the Father spoke from Heaven saying, "This is My beloved Son, in whom I am well pleased" (Matthew 3:17). Satan likes to put wrong ideas about God into the minds of people. God wants us to have right ideas about Himself, so He sent His beloved Son that we might know what He is really like. The Bible says, "No man has seen God at any time; the only begotten Son, who is in the bosom of the Father, He has declared Him [shown Him to us]" (John 1:18). Jesus taught us and showed us that God loves us in spite of our sins. God knows all about our sins, but He loves us so much that He cannot bear for us to be lost. The Bible says that God "is not willing that any should perish [be lost], but that all should come to repentance [turn to God]" (2 Peter 3:9). One time some mothers brought their small children to Jesus for Him to bless them. 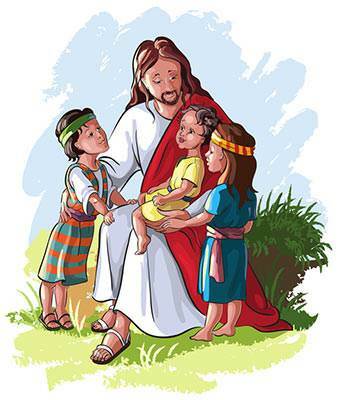 Jesus loved the children and they loved Him. He took them into His arms and blessed them. The disciples probably thought that the children were bothering Jesus, so they told the mothers to stop bringing their children to Jesus. When Jesus saw what the disciples were doing, He was very upset with them. The Bible says that He was "much displeased." He said to them, "Let the little children come unto Me, and forbid them not: for of such is the kingdom of God" (Mark 10:14). What is God like? He is like Jesus! The Lord Jesus said, "He who has seen Me has seen the Father…" (John 14:9). So we know that God really loves children. Jesus said He was the Son of God. He proved that He was the Son of God by the mighty works He did. • Jesus calmed the wind and the sea. In Matthew, chapter 8, we read about a time when Jesus was in a small ship with His disciples. Jesus fell asleep, and while He was sleeping, a great storm arose. 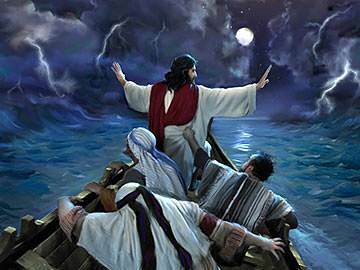 The storm was so fierce that the disciples thought the little ship would sink. They woke Jesus, saying, "Lord, save us!" • Jesus had power over evil spirits. Evil spirits are servants of Satan. Sometimes they enter people and cause them to do terrible things. When Jesus commanded them to come out of a person, they obeyed Him instantly. The evil spirits knew that Jesus was the Son of God. You can read about this in Mark 5. 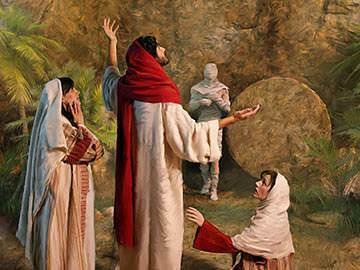 • Jesus even had the power to raise people from the dead. Suppose a dear friend of yours had died and you went to the funeral. Suddenly the preacher walked up to the casket and said to the dead person, "Arise!" and the person got up and walked around talking with his friends. Would this not be the most amazing thing you had ever seen? Jesus did not come into the world just to do wonderful works; He came to die for our sins so that we could be saved. When John the Baptist first saw Jesus, he cried out, "Behold the Lamb of God, who takes away the sin of the world" (John 1:29). On the cross, Jesus bore the penalty for our sins. When He was dying, He said, "It is finished!" He had paid the full penalty for our sins. We are saved by believing on Him. 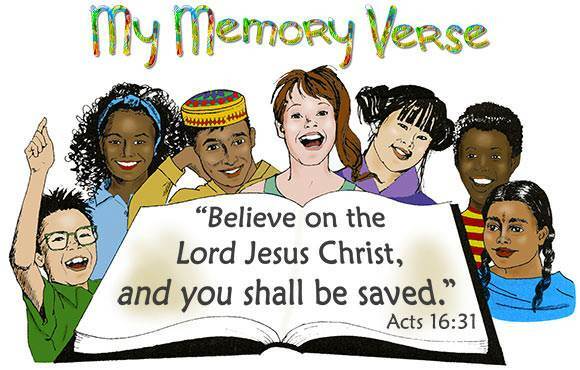 The Bible says, "Believe on the Lord Jesus Christ, and you shall be saved…" (Acts 16:31). 1. Jesus Christ is God. Jesus said, "I and My Father are one" (John 10:30). 2. God the Son has been here. Think of it! God has been here on this earth! Speaking of Jesus, the Bible says, "Great is the mystery of godliness: God was manifest [seen] in the flesh…" (1 Timothy 3:16). 3. Jesus Christ paid the penalty for our sins. When we take Jesus as our Savior, God forgives us of all our sins because His Son died for them. God forgives us for Jesus'sake. The Bible says, "I write unto you, little children, because your sins are forgiven you for His name's sake" (1 John 2:12). "Father, I believe that Jesus Christ is Your Son, and that He died for my sins. And it is so wonderful to think that Jesus loved me so much that He willingly gave His life for me. I love You, and I believe on Your Son, the Lord Jesus Christ. In Jesus' name I pray." 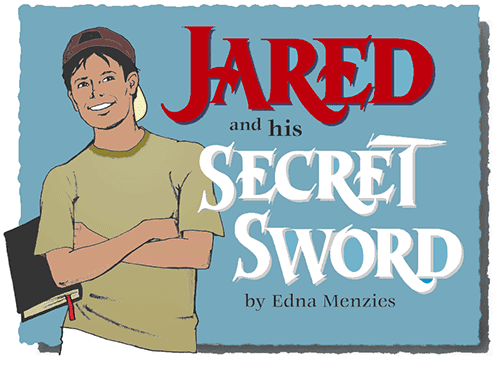 Jared heaved a sigh of relief when he heard the school bell ring. He wanted to find his best friend, Carlos, and tell him what had happened the day before. When Jared saw Carlos, he pushed his way through the noisy crowd in the hallway. Jared caught Carlos by the arm and said, "Hey, Carlos, I have something exciting I want to tell you. Can you come over to my house and talk?" "Sure!" he said with a grin. "Let me get my books and I'll be right there." 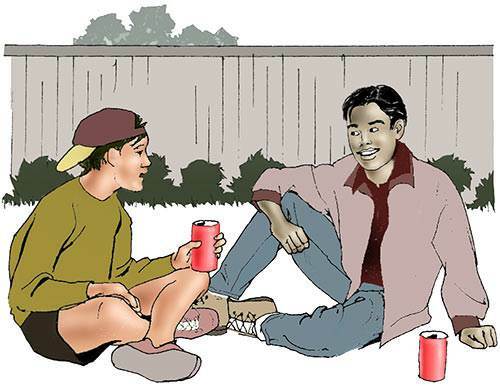 The boys went out to Jared's back yard and sat down on the grass. "Now what did you have to tell me that is so exciting, anyway?" Carlos asked. "You know how we were talking about what happens when a person dies?" Jared reminded Carlos. "Well, we went to church yesterday with my aunt and uncle and cousin Beth, who just moved in down the street. "Beth's Sunday school teacher showed the class from the Bible that we are all sinners and that death is the punishment for sin." "Oh Jared, everybody knows we all die sometime," Carlos scoffed. "Well, the teacher told us there are two kinds of death," Jared went on. "The death of our body is one kind. Then there is eternal death, which means being separated from God and lost forever in hell. But Jesus died to take the punishment for our sins. If we tell Him we are sorry for our sins and receive Him as our Savior, He will forgive us, come into our heart, and give us eternal life. Then, when our body dies, Jesus will take us to live with Him in Heaven forever." "So?" Carlos did not sound very excited about Jared's wonderful news. "So, I…I…stayed and talked to the teacher after Sunday school," Jared continued. "I asked Jesus to forgive me and be my Savior, and He did. Carlos, I know Jesus came into my life. The teacher showed me from the Bible where Jesus said, 'I give unto them eternal life and they shall never perish.' I want you to have Jesus as your Savior too, Carlos. I know you will be glad just like I am." Carlos rolled over on the grass with a frown on his face. "No, Jared, I'm not interested. My sister Lisa came home from camp last year and said she got saved. She was real nice for a while, but it didn't last. She acts worse than ever now. I guess I will wait to see if this does you any good before I try it." Carlos got up and walked toward the back gate. "Thanks for the talk, Jared. I'll see you later." Jared was very disappointed as he watched Carlos walk out of the back yard. He had failed to convince his friend about Jesus. But Jared was determined to prove to Carlos that being a Christian really does make a difference in a person's life. The following days at school were not easy for Jared. Others began to notice that he had stopped cursing and saying things against the teachers. 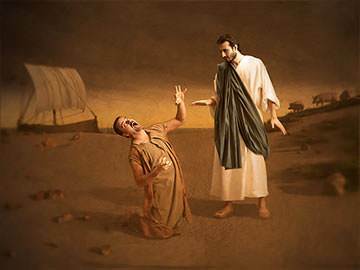 When Jared refused to help some of the guys steal candy bars from the corner store, they began to call him "Preacher Boy." Carlos did not say much when others were teasing Jared, but he was watching him. What concerned Jared more was that Carlos was spending more time with a troublemaker named Alex Simons. By Friday afternoon, Jared was discouraged as he left school. It had started to drizzle and he needed to get home so he could finish Mr. Bennett's yard before it got too wet. As Jared walked from the Bennett's back yard to the front, he saw someone with a jacket draped over his head run out of the yard. He watched him run over to Carlos' yard. Jared muttered to himself, "I wonder why Carlos ran off. He knew I would be working here this afternoon." Suddenly Jared's mouth dropped open as he looked at the Bennett's front yard. The flowerpots had been turned over and the flowers scattered in the grass. "The Bennetts will be so mad when they get home!" Jared thought to himself. Without stopping to think, Jared ran down the street to Carlos' house. 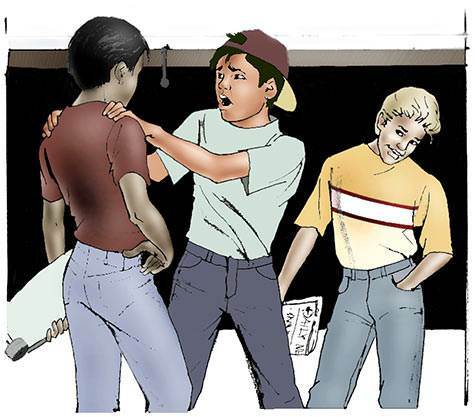 Carlos was starting to shut the garage door when Jared grabbed him. "You mean worm!" Jared shouted furiously. "Why did you dump over Mrs. Bennett's flowers? Why do you want to get me into trouble?" "Leave me alone! I didn't do anything to those flowerpots." Carlos replied. "Oh, yes you did!" Jared said as he pushed Carlos. "And you are going to go fix what you did and clean up the mess." "Ha - Ha - Ha!" Jared heard Alex from inside the garage. "I told you, Carlos, that Jared's religious stuff would not last." "Yeah, I guess you are right. Jared can't even take a joke," Carlos said with scorn in his voice. "A JOKE!" Jared yelled as his face burned with anger. "You call messing up someone's yard a joke? That's just plain mean." Jared turned and ran down the street feeling sick inside. Jared returned to the Bennett's yard. He carefully put the dirt back into the flowerpots and planted the flowers again. After giving the flowers more water, he turned to go home. Who turned over the Bennetts' flowerpots? What will Jared do next? Don't miss the next chapter about Jared—coming in your next lesson.